I don’t ask for audience participation very often, but today I’d like you to do me a favor. The next time you’re home, walk around and take pictures of every room in your house with your cell phone. Pretend you’re documenting the place for when they make a movie of your life. Feel free to cast your favorite Hollywood stars as the main characters. These photos will be really valuable if (or perhaps just when) someone kicks open your front door and steals your stuff. It doesn’t happen very often, but in our zip code it happened 541 times in 2011. There are about 35,000 residences in our zip code, which means about a 1 in 65 chance a given house will be broken into. Last Tuesday it happened to us, while I was presenting about Software Bot Platforms at SXSW Interactive. While you’re taking pictures of everything, make sure you have photos of everything that’s worth over a hundred bucks or so, especially those TVs, PlayStations, Xboxes, and the like. I’d suggest you flip those things over and take pictures of the serial numbers, too. That information’s really hard to dig up once they’re gone. Lets say someone does decide to break into your house and steal your stuff. Most burglaries happen through the front or back door, just kicking the thing in (or finding the key you left under the mat or rock). If you’re like most people, when you installed your front door you might have used the cheap screws and shallow deadbolt. If you don’t know, unscrew the screws. If they’re shorter than 3 inches, replace them with nice strong 3 or 3 1/2 inch screws from the hardware store. If you’re leaving the house, always lock the deadbolt. The handle latch can be pried open with a screwdriver, or kicked open with one swift kick. Most burglaries happen between 10am and 3pm, prime “I’m just going to leave for a few minutes” time. If you have a really cheap deadbolt, think about upgrading to a grade 1 or grade 2 deadbolt. If you’d really like to secure your front door, consider a metal reinforcing strip. They make them for french doors, too. If it takes more than a few minutes to get your door open, they’re probably going to leave. You can drive yourself crazy researching bump key resistant locks, but if you really want the best, you can spend quite a bit. I’d guess the people who broke into our house were inside less than five minutes. They look for houses that are easy to get away from. We live on a corner two blocks from major north/south and east/west arteries. They’re probably going to hit your bedroom first, they’ll pull out the drawers in your night stands (looking for jewelry or guns or small electronics). Maybe like our break in, they’ll grab a random bag to store their loot. Maybe a bag with a lot of memories to you. After the break in you’ll marvel at the things they didn’t take, the jewelry box they didn’t find, the cameras or hard drives, but some things will still be gone, and inevitably they will be things you care about. Then they’ll hit the living room. They’ll grab things that are easy to sell, like your TV, your Xbox and Playstation. They’ll clear out your collection of Xbox games. Later you’ll realize that while the TV and devices are replaceable, the save games sitting on that Xbox’s hard drive are not. The three playthroughs of Borderlands 1 and 2 you did with your wife, with all the awesome characters and loot? All gone. The hours you spent with your team in Mass Effect, and how you were a couple hours from the end, eagerly awaiting the last DLC? Gone. You’re probably not going to finish Assassin’s Creed 3 now, and thank goodness you never even started Skyrim. Your daughter may point at the place the TV was and say “uh oh”. The first couple of times it’s cute, but it’s also painful. Just be glad she wasn’t there when they broke in. You’ll probably also spend some time wondering why they would bother to take her new pair of red sneakers. But then you’ll realize that the people who broke into your house might have kids too, and then you’ll just be sad for the world. They’ll do really strange things, like take the Xbox from your living room but leave the power supply, and take the power supply for your other Xbox in your daughters room but leave the console. Of course, the power supplies are different, so you don’t even have one working Xbox anymore. It’s kind of senseless. They’ll grab the work laptop off your desk in the office, making a giant mess in the process (as if your office wasn’t a mess enough already). But they’ll graciously pull your USB VPN key out of it, and drop it on the floor before they leave, which almost makes you think that this was a Jason Bourne-esque black bag job and they’ve installed keyloggers and microscopic cameras everywhere to infiltrate your work accounts. That would explain why they didn’t touch your wife’s laptop on the desk opposite. But now you’re just talking crazy. When you get the call that someone broke into your house and took all your computers, you immediately think the worst, that everything is gone and in the hands of mafioso or triad hackers who intend to destroy you digitally as well. This is a good way to think, because it probably isn’t far from the mark, and certainly won’t be over the next decade. In our case we were lucky. Irma’s personal laptop was covered by papers, so they didn’t grab it. My main work laptop was entirely encrypted, and my other work laptop didn’t have anything loaded on it. They didn’t get my Time Machine backup drive, from which they could have reconstructed my entire life. My laptop was with me, as were our iPads. They got an old phone we were using for audio streaming, and the old iPad we used as a white noise generator for our daughter, but those didn’t have anything special on them. They didn’t steal our network attached storage device, which would probably be a treasure trove to the wrong people. In the end, we were very lucky. 1. Reinforce your doors. Always use your deadbolt when you leave the house. Both front and back doors. If you have a sliding glass door in the back, figure out a way to secure that thing. Don’t leave any of your windows unlocked. Don’t leave a spare key out in anything like an obvious place. Lock the door into your garage when you leave, garage door openers are easy to fake out and even manual ones are really easy to open. 2. Catalog all your stuff, it’ll make the insurance process easier, and you can do it in a half an hour with your iPhone. Serial numbers for anything that has them. Entire room shots. You never know what they’ll take. If you can, set a reminder to do it again in 6 months. Google Calendar is great for that. Back up those pictures on a PC or in the cloud. Make sure you have a passcode lock on your phone, those things are slipperier than a bucket full of eels. Same with your iPads or other personal electronic devices. 3. Make sure you back up your machines. We use CrashPlan. It’s money well spent. If you have a Mac and have a Time Machine backup (and you should), be sure to encrypt it (if it’s local) or hide the drive in an inconspicuous place (if it’s over a network). If you have a Mac, also turn on FileVault, so even if they get your computer, they can’t read the contents of your hard drive. Always require a password to wake from sleep or screen saver or login on boot. Pick a good password, something you don’t use anywhere else. Make sure someone else knows it, in case you get hit by a truck. If you have a PC, here’s an article that may help. If you have an Xbox and an Live Gold account, turn on Cloud Saves and use them. 4. Make sure Find My Device is turned on for all your iPhones, iPods, iPads, and Macs. You can wipe a machine remotely if it gets out of your hands and is still connected to wifi. Make sure you can login to iCloud and all your stuff is listed. One of my friends recommends Cerberus for Android. 5. You can secure your stuff a bit. If I’d had a cable lock on my TV, and they hadn’t been able to just lift it off the wall mount, it would probably still be here. There are also locks for your laptop, but that’s a pain if you like to be mobile. If your laptop lives on your desk, it might be worth it. Some larger TV wall mounts have holes for locks. If yours doesn’t, you might be able to thread a cable lock through it and make it harder to pull off the wall. 6. If you live near Austin and would like to fix up your security but don’t know how to do any of this stuff, are scared of screwdrivers, have a phobia of the hardware store, etc, let me know and we’ll get it done. In the next day or two we’ll pick up a new TV to replace the one from the living room. My daughter will be able to watch Sesame Street again. We’ll probably get another Xbox, and maybe another copy of Borderlands 2. I don’t think I’ll ever go back to Mass Effect. That save game was their world, I can’t re-create that. We’re probably going to install a camera in our entry way that watches the entry way and street, something that even keeps running when the power’s cut. Of course then there’s the back door, or a window. Your home isn’t a castle, it’s a barely held together shed with a bunch of memories and possessions inside that anyone with a reciprocating saw and 2 minutes of time could compromise. If someone wants your stuff, there isn’t much you can do to stop them, which in the end is the terrifying thing, because all we’d really like back is our peace of mind. 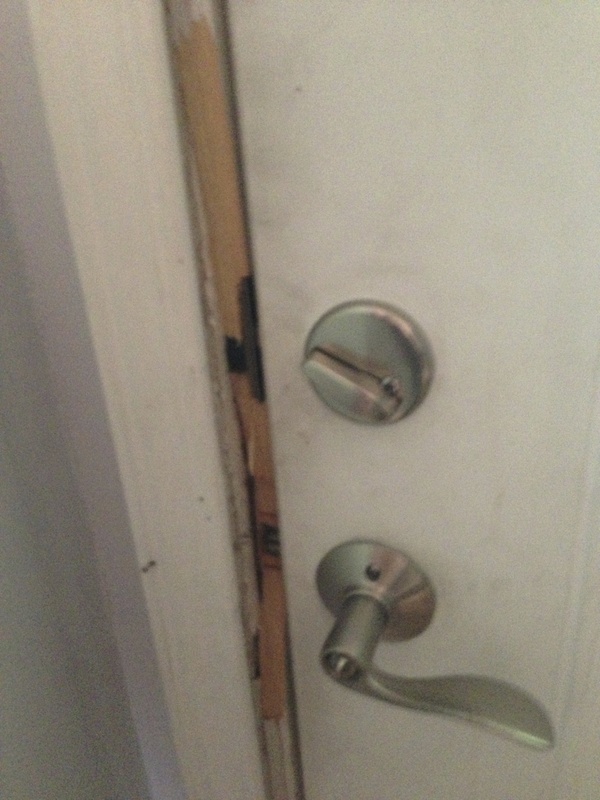 This entry was posted in How-Tos and tagged burglary, robbery, security on March 19, 2013 by Jeff Kramer.